First Chairman of Farnworth Urban District Council. Son of William Sumner, a Cheshire farmer. 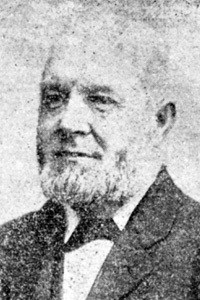 Elected to Farnworth Local Board in 1883 and retired from Farnworth UDC in 1904. On his election as Chairman in 1899 Thomas Ivers said that "Mr William Sumner was an old member of the authority who had occupied positions of Vice Chairman for several years and the experience he had gained would enable him to perform his duties with credit and efficiency." Nathaniel Nicholson said "Mr Sumner's long experience of Council's business would stand him in good stead. They had every confidence in his impartiality." Sumner himself observed that "he never sought the position as Chairman but had always taken a deep interest in the affairs of the town." During his Chairmanship, he was instrumental in promoting a conference of three ladies from each church in the town. This resulted in the formation of the Sick Nursing Association. He served on the Finance Committee from 1883. Before he was a Councillor he was a member of the School Attendance Committee, having been nominated by the Board of Guardians. He served from 1881 for 23 years and was one of the most regular attendees. He was made a Magistrate in 1913. He was a Wesleyan and regular attendee at the Victoria Mission Hall. The Farnworth Journal wanted to put on record his service and in 1904 carried a report of an interview with him, in which he reflected on his years of service and some of the main areas of concern. "On the subject of the Fire Brigade he said that it was now given much more importance, especially after the fire at Crooks Mill. A new steam fire engine had been purchased and arrangements made for the men to live near the station. The fire station was, though, unsatisfactory and a new one was needed. The men were all auxiliaries at present. The Baths (opened 1893) had proved very popular but improvements such as a new boiler and better lighting were needed. The Cemetery needed extending but the adjacent tip should be stopped. "visitors to the cemetery were often disgusted by the abominable smell which they attributed to other causes." He said the Infectious Diseases Hospital had been of great service to the community. The Council was right in taking up the tramway undertaking but Bolton Tramways Committee deserved little consideration. Farnworth Councillors would never forget a remark Alderman Nicholson of Bolton made, he said "the Bolton Committee wanted the meat and Farnworth could have the bones."